This seems to have gradually broken down through the red triangle, (nov16-july17) will we see 5.65, Black line? 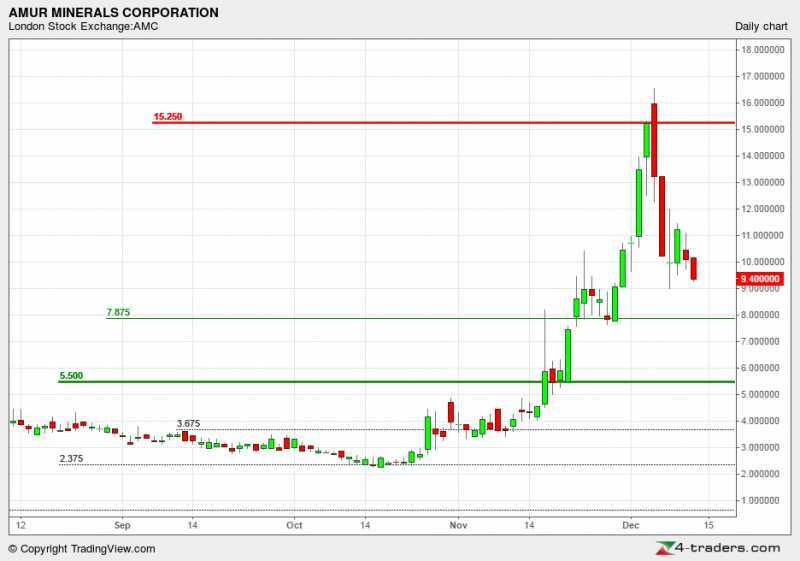 4.9 red horizontal line, seems like it has good support. Blue line is the uptrend since 2009, it does seem to be a drifter. May/Jun, is where the uptrend/downtrend lines and horizontal lines merge, amazingly around 5p. just a quick look at some stocks and charts we have been following. This needs to hold this triangle, if it fails to do so it could head to around 5.50/6p area. 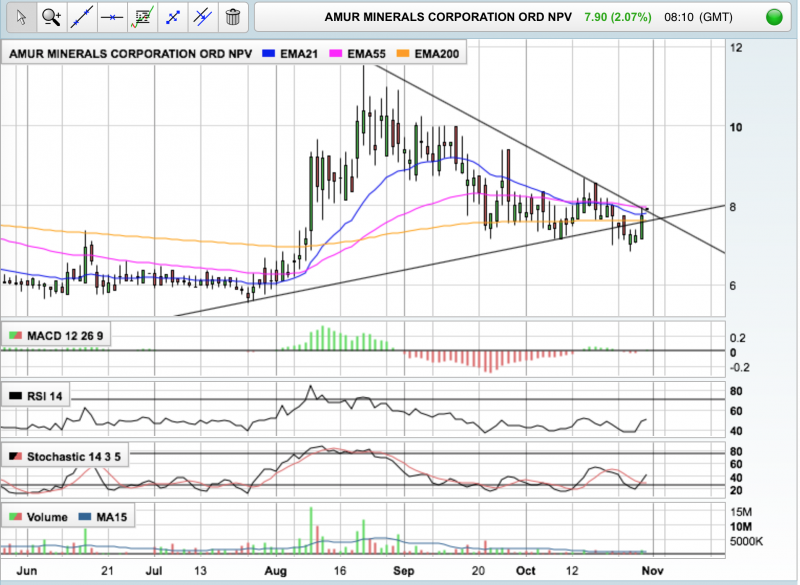 trendline/triangle is currently around 7p. good spot here Anne. It does look like a bullish falling wedge. The only issue this has it seems to be stalling at the 50 day ema line. Are we seeing the beginnings of a possible breakout here? Seems to be doing rather well the last few days! This looks like a solid basing taking place just under 6p. 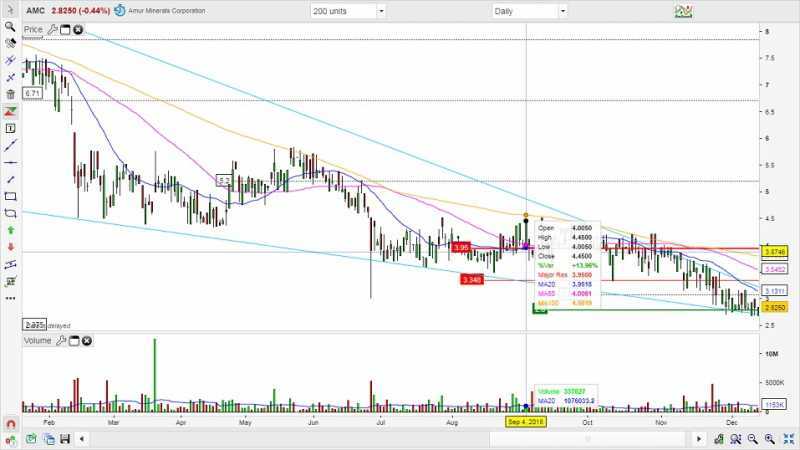 That's given us nice triangle, if it can break out above the triangle and 200 day ema line at just above 7p, on a eod closing basis, it looks to be long opp, even if it is only a short term scalp. another one to watch for now. Last Edit: 06 Jul 2017 22:45 by Trendfriend. Looks like another attempt at the 200 day ema line, and this should fail. Having failed to rally back up, I think we need to see if buyers come in for the stock...and how this closes the week out. 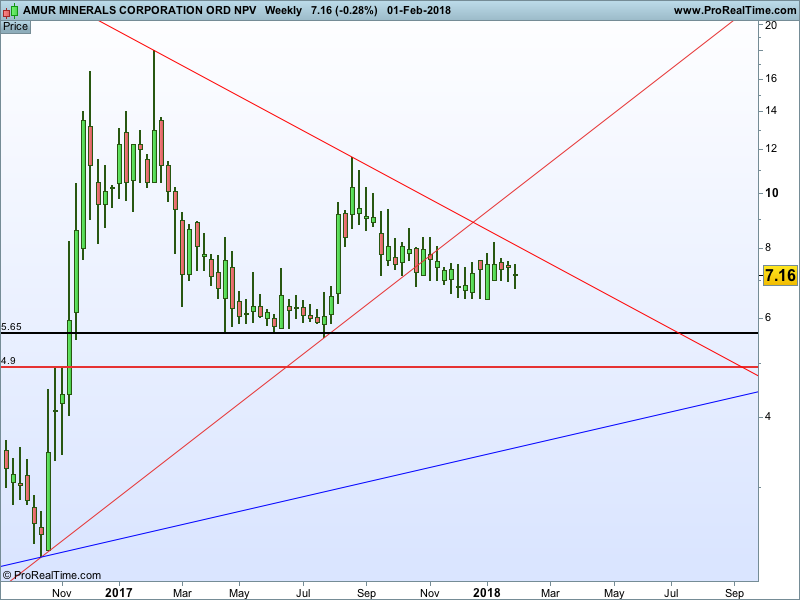 So weekly close below 7.9p (number changes daily) should open a move to 4.6p which to me looks to be the next support level....a gap support. Last Edit: 07 Mar 2017 18:50 by Trendfriend. Great analysis, remo. Hugely appreciated. When AMC goes off the boil it tends to do so for a protracted period, so those lower targets could well be hit. the fact that the 61.8 fib held once and then went through is also negative as ive seen many times shares correcting a full 100% if the 61.8 fib breaks down. So that would be the worst senerio target. Penny shares, kinda dangerious to trade as can go both ways fast. Last Edit: 07 Mar 2017 11:08 by remo. This broke through the ichmuku cloud support a few days back as well so looking bearish, but currently fighting the 200ema so this needs to hold or else it will go down fast to the lower levels around 6p area. Last Edit: 07 Mar 2017 10:58 by remo. This is sitting at a critical point. 10 and 20 EMA have pierced below the 50 and the 200 looks vulnerable. Am I right in seeing 5p as the next support below 7.5p. Certainly, after this morning's RNS there may be little on the fundamental front to prop up the SP in the short-medium term. Just a quick look here. so long at 7.5p, stop at 7p, i think thats a worthwhile trade from a rr perspective. SP breached the 50 day MA yesterday. Looking bearish. Last Edit: 15 Feb 2017 18:55 by Trendfriend. I'm still long here, and not sure what to make of it tbh.....obviously the rally and subsequent sell off are not good.....and i was unable to sell some of these on Friday am!! The daily does not look great (fridays candle), but the weekly still looks ok, lets see how this plays out Monday, and possibly the weeks or so......but i may bank some soon here imvho. I was late to this particular party but now out with a tidy profit. Good luck to anyone still in. 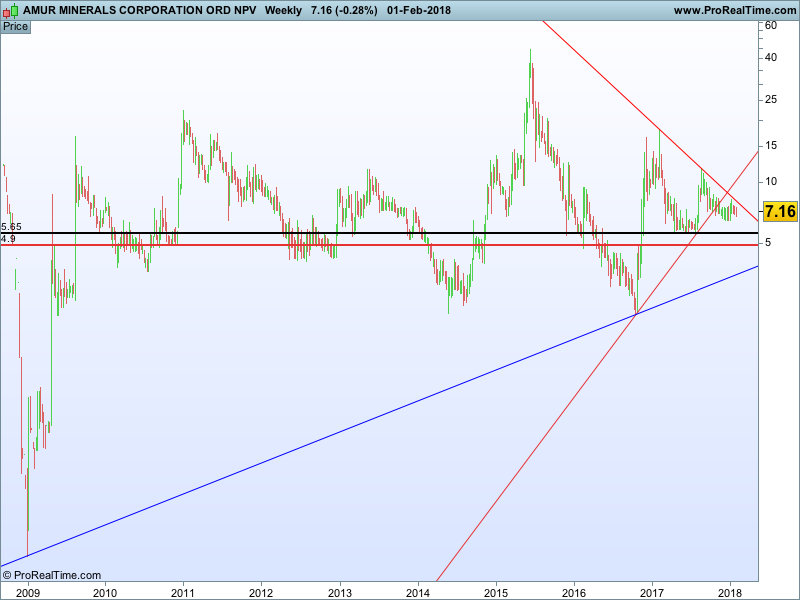 This has held up brilliantly well, and a break above 13.20p would essentially be a long term triangle breakout, a close above 13.20p should see a test of 16.5p and then quite possibly on higher imvho. Last Edit: 22 Jan 2017 12:40 by Trendfriend. Seems like I too should've waited.. I had three buys here, at 8.75, 9.89 and 12.4p, i closed them at 9.4p, for a small loss!! Last Edit: 14 Dec 2016 16:50 by Trendfriend. I think RC and Bonobo are quite right, this could go to 7p and possibly 5p, but only if we get a 2 x close below 9.40p. (the 20 day ema line, and that number changes daily). I'm not getting too bearish here, and this is still good mid to longer term imvho. Anyway i bought some more at 8.75p, but i'm just a bit loopy at times!! Last Edit: 13 Dec 2016 14:37 by Trendfriend. Will buy back at sub 8p. Stopped out already..
Looks like it wants to test the 61.8% retracement (2.5p-16.5p) at 7.85p. Could be wrong and 9.5p might hold. Just be careful of that bearish outside day candlestick from the 6th. Day late and a buck short on this one for you though! stop below the 200 and 50 day ema line, so at 5p. i think this should be ok it needed a p/b, and continue higher. Having said that this is AIM, so one has to sensible, i will bank some on a profit here. TF, did you buy with a stop loss set? Missed the low, but 11p isnt too bad..
Its 10.7p now...may go 7.7p? i think this should be ok, and todays low, may well be about as low as this may go. closed out the scalp long here. i think a p/b may happen here now, off course it could just defy all logic and continue higher! anyway the rsi is bang on support, if it breaks down a move lower to the 10 day ema line is possible around 11p area atm(that number chnages daily). I think a move to that area is a buying opportinity imvho. Like you say a profit is a profit I should be grateful, which I am. However I'm not finished with AMC and hope to get back on soon, just don't hope it's when it's on the way down.. This does look very strong! that is indeed a golden cross!! amazing! This closed above 15p today! i don't see any resistance until 20p here! I don't think you (or we) should feel gutted as such, Chief. Where to sell is just as important as where to buy, and off course in hindsight buying at sub 4p i should have held on longer. The thing here is, in hindsight i'm the best trader in the world! Anyway i bought a small amount of these at 13.75p, a small buy, and i'll be watching it like a hawk, as i dont' want to get caught out here. Last Edit: 05 Dec 2016 17:46 by Trendfriend. How strong is this performing, gutted I sold at 8.8. Totally feeling gutted. One of my mate at wrk bought this for 25p. 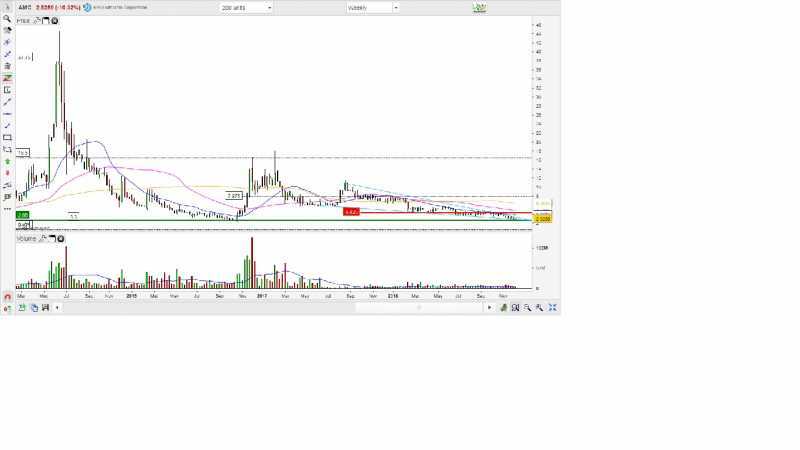 I was watching this for long...got funds ready as it near 5p...ghen saw it sub 3p. Didnt buy...5k£ still waiting in my ISA. Totally gutted..would hav been great going into xmas after a bad year with xel & gkp. 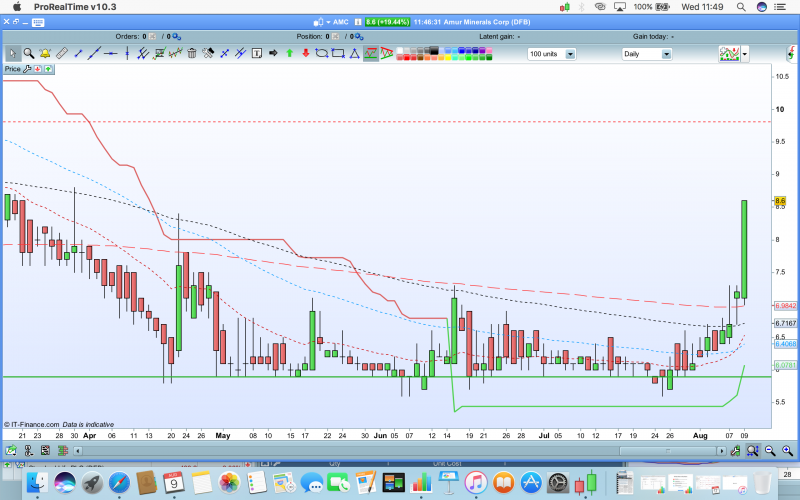 50MA cross 200MA... i'm probably wrong..
Been on watchlist ..just miss sub 3p.